Silca's constant improvement and high-quality details keep their pumps operating for a lifetime. The 242 Gasket for Presta Chucks uses a fully-synthetic, elastomer base material that increases the life expectancy five times over previous materials. Two-stage seal geometry seals on both valve stem and at the base of the core threads for a better seal and improved durability. Fits all Silca Presta heads. Works with 30.0/30.2 and 17-4 Stainless Presta-only chucks. Made in USA. The replaceable gasket continues the Silca tradition of fully serviceable products. This rating is probably confused with a general rating of Silca pumps. 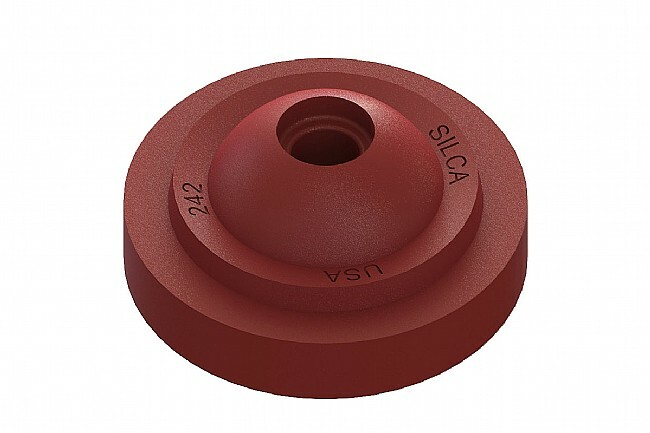 The design of Silca products allows for replacement of any parts as they wear to extend the lifetime of the pumps. This design has kept my Silca going for 22 years. This gasket is probably the tenth in that time. The pump sees very regular use. Daily and often by multiple users at club rides. Didn't seal. Gage needle dropped as quickly as the pressure stroke raised it. Went back to large rubber washer, which worked just fine. Maybe I didn't give it enough chance, but if it's still in the junk parts box when I'm out of rubber washers I'll try it again.